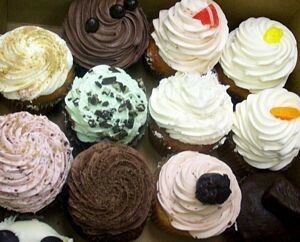 Cupcakes are just a few of the treats at Edible Incredible Desserts in Reston. In my opinion, January is not too early to start thinking about Valentine's Day. And, let's be honest, about the lovely chocolate treats that make it a day worth celebrating. One of my favorite local Reston businesses for cakes and confections is Edible Incredible Desserts at Reston Town Center. I can practically taste the fudge as I write this. A common passion for desserts led couple Alan Furman and Robyn Hanna to pursue their dream of creating a shop specializing in irresistible gourmet treats. Edible Incredible Desserts launched in 1999 with a kiosk in Fair Oaks Mall, selling fudge and toffee. Today, Edibles Incredible Desserts is a local favorite--named winner of Northern Virginia's best bakery & best kids cakes as voted by 150,000 readers of Northern Virginia Magazine. But the greatest joy for Alan and Robyn is when seasoned customers come in and begin telling others how great their products taste. Immediately after launching their business, their two flagship products "Robyn's English Toffee" and "Alan's Secret Recipe Fudge" became hot sellers at Dean and DeLuca in Georgetown. Soon after, they opened their first store in the Reston Town Center (next to Pot Belly, near the fountain). You don't have to go to Reston Town Center to enjoy a delicious dessert--they ship their moist, dense & exquisite wedding cakes, decadent homemade fudge and brownies, beautifully custom-made and delicious all-occasion cakes, award winning chocolate truffles, high-end cupcakes for all occasions, scrumptious cookies, and artfully designed custom gift baskets anywhere in the country. In early 2007, they opened a commercial kitchen and production facility in Sterling, Virginia, just minutes from Dulles Airport. This allows them to ship their baked goods and other desserts right out of the oven and ship fresh directly. Their motto is to please palates everywhere. And they do ... in our stores and on-line. Enjoy browsing through their site, and maybe order a cake online. Call them anytime to discuss their products 703-437-3008.